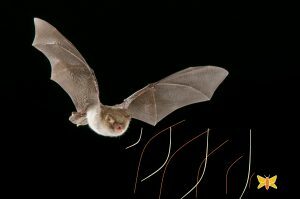 Very little was known about how bats found their way around in the dark until the 1950s when Donald Griffin discovered echolocation. 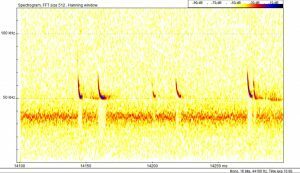 All bats can see, there is no such thing as a blind bat, but some can see better than others and all European species use a form of sonar to enable them to fly in darkness. They make high-pitched squeaks and listen for the echoes that bounce off obstacles in their way, or off prey insects, gauging distances by the amount of time taken for the echoes to return. 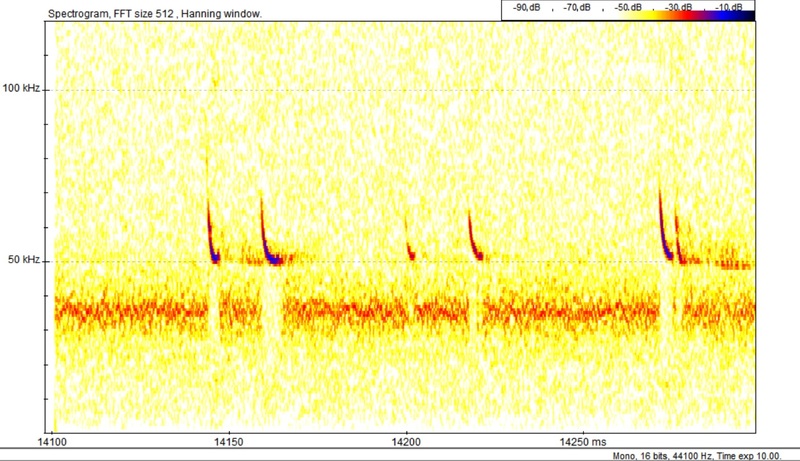 Illustration of soundwaves from echolocating bat reflecting from insect prey. Echolocation calls are made at a frequency (pitch – measured in kilohertz (kHz)) too high for humans to hear so bat workers use bat detectors to listen in on echolocating bats. For information on bat detectors see Bat Detectors – getting and using them.